to me... a photograph isn't about what you see, it's about what you feel. I am so thrilled that you have made the choice to come visit my site. I would love for you to get comfortable and stay awhile. 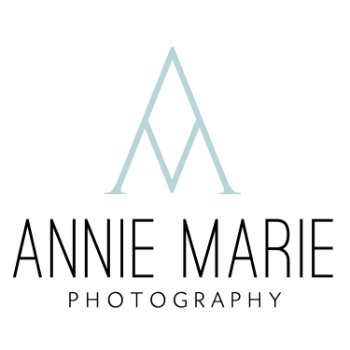 Take a peek around and discover the world of annie marie photography! I have built my world around what I love most. God. My family. My friendships and my photography business. (ok, and maybe some chocolate once in a while). I truly believe my calling was to create lasting memories for people. Whether that be the beautiful relationships I have formed with my clients, or that perfect photograph that has captured a personality or moment you will now treasure forever. You see... I am not in this for me. I am in this for YOU. I want you to have the best experience from your first hello until you are enjoying your photographs with family & friends. I get how much you don't like to be in front of a camera. I get that you are busy. I get that you are on a budget. But I also get that people regret not capturing special times until it's too late. A single photograph is worth so much more than the paper. It is a memory brought to life at any moment. When your kids grow up. When your parent is gone. When life changes. You don't get a second chance. Photographs are priceless and I feel honored I get to create that for others. Enjoy peeking around and please feel free to contact me to let me know how you want to be photographed. My 2020 Senior Info Guide is 45 pages of great information inside the Annie Marie senior experience. Get information on why Annie Marie is the photographer for you, session details, style guide, location information, testimonials and FAQ's. Click on the link to get in touch with me and inquire about your guide today! I am happy to send you one! This may be a new word for you but wow these images are amazing! They are basically a blend of a photograph and a video. I am thrilled to be now offering Cinemagraphs in my session offerings! GET MORE INFORMATION ON CINEMAGRAPHS! Although my number one priority is taking good care of my clients needs... I could never grow and get better if I didn't challenge myself daily. I often enter image competitions to keep me on my toes both creatively and technically. I love learning and feel that I can better serve my clients if I am serving myself as well. Here are just a few of the fun awards and recognitions I have received. Interview about my business and shooting from the heart. Third place in the Senior category of the 2017 International Winter Image Competition. Contributing article for Senior Style Guide Magazine on how to create a great senior experience. Chosen out of 50 photographer representing Minnesota in creating a photo session and story of a deserving woman. One of my images was chosen out of over 544,000 entries to be included in their 2018 Capture Minnesota book. 2 images were chosen to be featured in the 100 Inspirational Teen Images publication of the Modern Teen Style Magazine. Chosen as one of the top 50 established senior photographers in 2018! A huge honor to not only have been chosen as one of the top 200 senior photographer internationally, but also to have reached Gold Elite Status by having 6 images chosen for the premiere issue of the Senior Year Magazine. But the best part was having one of my images chosen for the cover! Awarded one of 50 Best Senior Images of 2019. My image won best studio light image. Get in touch with me for any questions you might have! featured sessions, stories, & other musings from my studio! Please visit one of my design shops on ETSY or SOCIETY6! Check out the latest senior sneak peeks and BTS! Keep up with the latest sneak peeks & promos! Sign up for my email list and be the first to get updates, news & some special exclusive offers only for the A-listers!